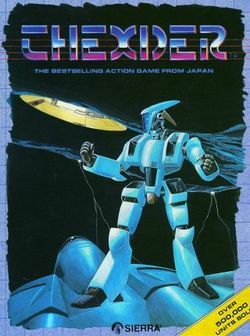 Thexder was the evolution of transforming robot games such as Formation Z and Volguard. Thexder is a robot that is capable of transforming into a jet, in a manner similar to the Robotech VF-1 Valkyrie, or Decepticon Starscream. The game was not limited to side scrolling like it forerunners. Instead, it could scroll in all directions. Thexder was also a more capable fighter, with a computer assisted threat targeting system and a particle shield that is as much a weapon as it is a tool for defense. Thexder also bears the distinction of being the first title published for the Famicom by Squaresoft, the company who would be better known for its Final Fantasy series. But Thexder was not developed by Squaresoft. Rather, it was developed in a talented Japanese studio known as Game Arts. The designers have sited Atari arcade game Major Havok as one of their inspirations. Game Arts released the game on several popular Japanese home computers, including the MSX, where it sold tremendously well. Sierra Entertainment bought the rights to release this successful game outside of Japan, and it was just as successful, becoming a best-seller for Sierra. The Famicom conversion was never converted for play on the NES. The story for Thexder is not overly defined. Thexder is a Hyper Dual Armor mech outfitted with a beam rifle and a particle barrier and a jet mode with a Mach 4.1 max speed. Your goal is to pilot Thexder through 15 stages, until you reach the central computer that you have been assigned to locate and destroy, in order to save the planet. Thexder has an energy meter. Contact with enemies, firing the beam rifle, or engaging a particle shield drains that meter. Destroying certain enemies and completing stages replenishes Thexder's energy meter. There are no requirements to most stages, only that you locate the exit found on the far right end of the stage. Some stages require you to defeat a computer system before you can proceed. You can engage a particle barrier at the cost of 10 percentage units of energy. While the barrier is present, enemy contact will drain the barrier and not Thexder, and enemies will sustain damage from the barrier. As a robot, the beam rifle is automatically aimed through the use of Thexder's threat identification system. As a jet, the beam can only be fired forward. The game is over if Thexder's energy is ever reduced to zero. This page was last edited on 28 June 2012, at 04:01.